This morning I recalled that the National Archives in Dublin have made their census records for 1911 freely available online for counties Dublin, Kerry, Antrim and Down, so I thought I would seek out the returns made by my Co. Antrim ancestors. My entire paternal side all hail from Co. Antrim – but in terms of direct ancestors this translates into just two households as all my great-great-grandparents on that side are deceased by 1911. I must congratulate those behind this project for the Census search interface is very responsive and easy to use. You can browse the records by drilling down through County » District Electoral Division (DED) » Townland, which will show a listing of all the households in a townland. There is plenty of room for improvement, however. A small gripe is that there is no interactive map interface when you browse, so some knowledge of place names and geography is required. There also appears to be a major inconsistency about the use of spaces in names prefixed with O, Mac and Mc. This caused me some serious head-scratching when searching for my McGAREL ancestors. By browsing their townland I discovered that their names had been entered as Mc GARRELL – the variant wouldn’t have hindered me, but I was completely thrown by the space. Constructing a HTML table (making extensive use of the rowspan attribute) to display a pedigree chart is quite a brain-teaser. I have Diana Gale Matthiesen’s website to thank for helping get my head around it. Looking at the pedigree above, I can see that by 1911 none of my great-great-grandparents are living, so the households of two sets of great-grandparents is what I’m looking for, namely: Daniel MULVENNA & Catherine MATTHEWS in the townland of Gowkstown, Glenarm and Arthur McGAREL & Elizabeth MORROW in the townland of Deerpark, Glenarm. My great-grandfather was known as Dan O’Gowkstown – he and Catherine had 9 children (confirmed by searching the birth registration records many years ago). The full family group is shown in the table below. Being economical with the years? You can see by comparing the dates above with the census return below that nearly all the children’s ages have been “compressed” by 2 years. Both the parents in the household are reported to be 56 on 2 April 1911. Daniel was actually 54 and Catherine was probably 63. Nearly all the children are 2 years older than reported on the census – e.g. John and Maggie were actually 19 and 16 respectively as opposed to 17 and 15 recorded on the census. 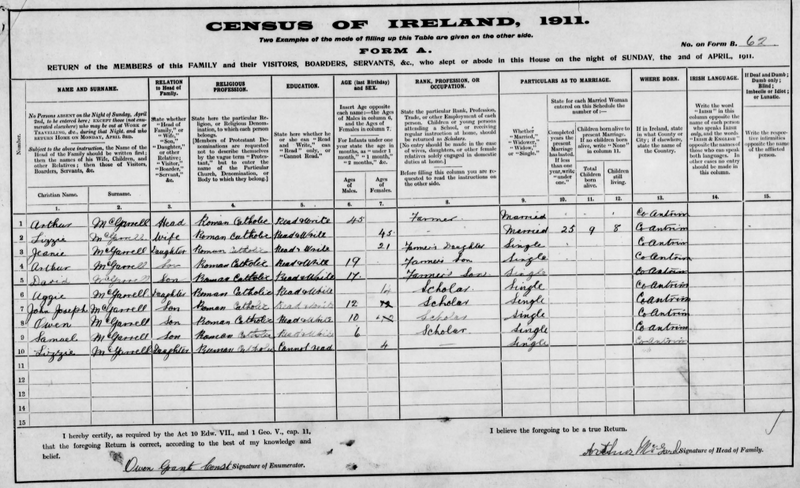 Daniel and Catherine were married on 22 September 1876 but the census reports they have been married 32 years. I researched the tragic 1913 rail crash in Canada, where Patrick was killed and the Irish News gives his age as 25, although he would have actually been 27. Curious. Update: talk of pension affecting 1911 census ages? Hugh Hamilton makes the point in the comments that talk of a new government pension scheme is thought to have motivated some people to inflate their ages on the 1911 census. I’ve gone back to check their entry on the 1901 census to check out this theory. In nearly all the cases, younger ages have been recorded, usually by about 2 years. I reckon the most likely reason is that Daniel based the ages on his eldest being born when he was 21 and worked his way back from that point. Children still of school age generally have their age recorded accurately. 1In 1911, Mary was married to Arthur Gibson and living in the Libbert. 2In 1911, Rosena was married to Frank Campbell and living in Deerpark. 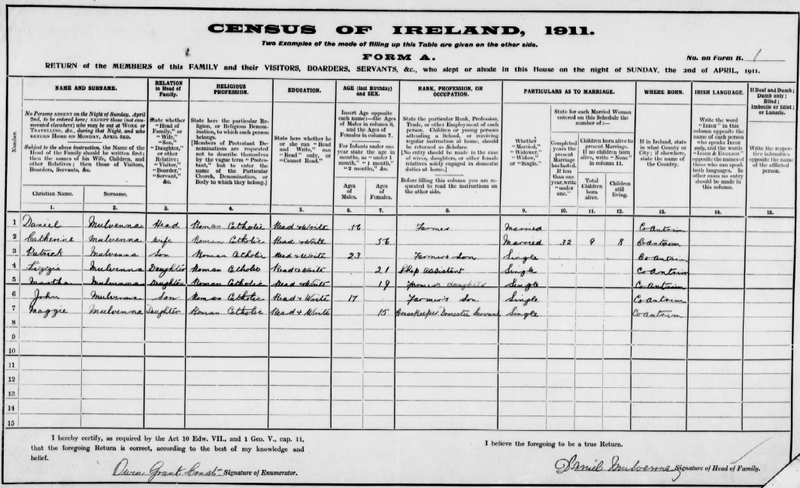 3Charles Mulvenna couldn’t be located on the Irish 1911 census. According to my uncle Anthony, Charles made money in America. He married Sarah Gibson of the Libbert in 1921. Hi Gerry, I to have found the dates on the 1911 census do not correspond with marriage certificates etc that I have already got and I had some dates on the 1901 census and by the time it reached 1911 my granny was now 2 years older then my granda. Also most of my relatives had their ages changed by 2 years as well. I would just like to say that your website has been very helpful in tracing a lot of dates and I would like to say thank you. Thanks for the comment, Yvonne. My dad was telling me that Rosena and Frank’s daughter, Winnie Campbell, was his godmother. My great-grandfather John Mulvenna emigrated to America in the later 19th Century. He was born circa 1870 and settled in Philadelphia. His family came from Belfast. His mother’s name had Stewart in it, though I don’t know if it was her maiden name. She died in January 1918. He had several siblings in Belfast that remained. One of the nieces was named Rose, and the other was Ellen. Another clue: colorblindness runs in my family. Does any of this ring any bells for you? Hi@Regina thanks for posting a comment. I have quite a lot of birth / marriage / death data for MULVENNAs and McILVENNAs in Ireland, kindly gifted to me from the research of Matt McILVENNA. What do you know of John’s parents? Did John’s mother die in Belfast? There aren’t actually too many John MULVENNAs born in Belfast circa 1870 – is the Belfast birthplace definite or approximate, do you think? There’s a Rose MULVENNA d.1918, Belfast aged 75, but I only have index info, so I don’t know if she was married or a spinster. My GG Grandmother was Mary Gibson(sister to Elizabeth), Do you have Charles Gibson 1796-1877 and Mary McKay 1793-1865 as their parents? My “reply” is not working for some reason. We live In Reading, Pennsylvania – about an hour from Philadelphia. Send me your email at Wolfe****@****.com and I’ll invite you to my Ancestory tree. My GG grandfather was was John McErlean (16 deerpark Farms). I believe they lived next farm over from Patrick and Elizabeth. Generally the ages on the 1901 census tend to be more accurate. In 1911 there was talk of a new government pension and people thought thay by increasing their age by a few years they would help their chances of getting the pension. I have found this on many of the family records which I have looked at. @Hugh Hamilton Thanks for that interesting angle. I looked up the 1901 census (see update above) and my MULVENNA ages are still a bit off, mostly reduced by 2 years for the children, so there’s probably something else going on. my paternal grandfather was Patrick Mulvenna; his parents were Robert and Mary Mulvenna (nee Hamill), married in St MacNissi’s in Larne in 1886. Wonder why the name change? My dad was adopted! Patrick was born in 1895 in Scotland, and twice lived in Canada, fighting for the Canadians in the First World War. He came back to Scotland, married, and my dad was born in the 1940s. I think we may be related. The witness at Robert Mulvenna and Mary’s marriage was a Daniel Mulvenna. I checked all this out on Ulster Genealogy, pay-per-view records. Have you tried these records? My Great Great Grandmother was Martha Louisa Gertrude Mulvenna and was born on the 18th October 1868 at Deerpark, Glenarm. She married Samuel McCartney on the 25th February 1895. This was his second marriage his first wife having died. Martha and Samuel had children, Alice, Thomas (my Grandfather), and Gertrude. I understand that Samuel and Martha were made wards of court for Martha’s sister, Elizabeth (Tierney) sister’s children when she and her husband were killed. Martha moved to Dublin with her children after Samuel died and then years later moved to Nairobi, Kenya with her daughter Gertrude to be near her son Tom’s family – Alice by then had died. I was really interested in the colour blindness – both my brother and I are colour blind, so maybe there is a family connection. Am thinking about going over to Northern Ireland to do some more research but anything you or any other family members may have to add to my links would be most welcome. Thanks for posting Irene. It’s great to hear from you as I researched quite a lot about Martha and Samuel in the 90s when I did most of my family history research. I’ll drop you an email. The Ulster Covenant: part of my heritage? John on The Ulster Covenant: part of my heritage?